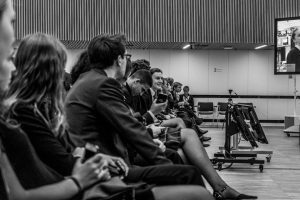 The Espergærde Gymnasium Model United Nations project began in 2003 when students from Espergærde Gymnasium & HF had taken part in the BONAMUN Conference in the Netherlands. The students felt inspired and were eager to facilitate something similar at home. 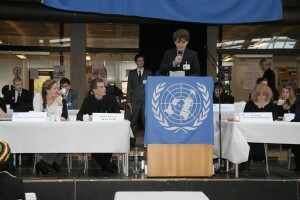 However, MUN Conferences did not exist in Denmark, so the students initiated the very first one at their own school in 2003. 50 delegates participated in the conference. 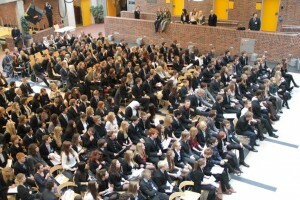 Since then EGMUN has been an annually returning conference, and today it remains the largest in Denmark with approximately 400 students. In 2008 the conference had expanded, so now more than 300 students from 8 different countries participated. 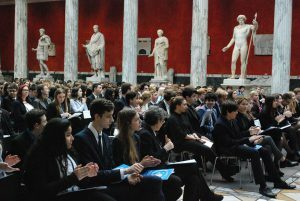 The EGMUN 2008 Opening Ceremony was held in the historic halls of the Copenhagen Chamber of Commerce, in the presence of the Danish Minister of Education, Mr Bertel Haarder. In 2009, the opening ceremony was held at Copenhagen’s Odd Fellow Mansion. The conference dealt with environmental issues, inspired by the COP15 meeting in Copenhagen, which took place only few days after the conference. In 2010, EGMUN had the honor of a royal visit; H.H. Princess Marie held the opening speech alongside the Danish Minister of Education, Tina Nedergaard. The conference addressed a common criticism of the the United Nations organization as a whole. 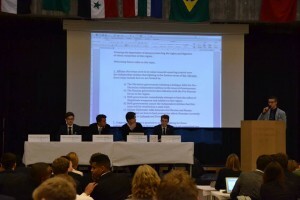 An ambitious reform of the UN was debated and implemented by the Security Council. In 2011, the conference had its focus on the Millennium Development Goals, where H.H. Crown Princess Mary addressed the house at the opening ceremony. The ECOSOC was permanently reformed and now consisted of several sub-councils. EGMUN 2012 featured the largest ECOSOC Council in EGMUN history, with more than 100 delegates. In the General Assembly matters such as the potential natural resources of the Arctic Region and the transparency of the UN were debated. H.H. 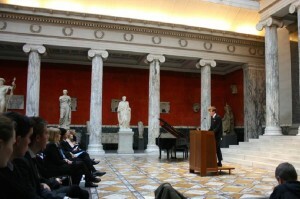 Princess Benedikte and a representative of the Danish Ministry of Foreign Affairs addressed the house at the opening ceremony, which was held at the beautiful Ny Carlsberg Glyptotek Museum in Copenhagen. For its 11th session, EGMUN delegates debated issues under the overall topic of Science and Peace. The Security Council had its focus on international surveillance programs and the situation in Syria. The speaker of the Danish Parliament Mr Mogens Lykketoft addressed the house at the opening ceremony, which once again was held at the Ny Carlsberg Glyptotek Museum in central Copenhagen. This year, the press corps introduced daily a full length news-cast, covering the action from the sessions and the social life. The Crisis Committee dealt with the question of the Falkland Islands and interacted with the press corps to keep the debate as updated as possible. The conference of 2014 addressed the topic of how the Millennium development goals were to be reached by 2015. Furthermore EGMUN2014 introduced a lot of new ideas not only to the debate. The Historic Security Council was introduced for those who wanted to solve the problems of the past. On the social side of the conference “Saturday I’m in love” was introduced to those looking for a little love in the future so they could send a piece of chocolate to that special someone. In EGMUN 2015 the main topic was facing new threats. In the year of 2015, we reached a number of 450 participants, making it one of the biggest MUN-conferences in the northern Europe. The conference had some very profound debates which resulted in many resolutions passing the GA. The main topic of EGMUN 2016 was ‘changing limits’, where almost all committees and councils were focused around changing the contemporary understanding of limits in areas such as women’s rights etc. The opening ceremony of EGMUN 2016 was held in the UN city in Copenhagen, where guest speakers even included a UN-employee. Furthermore, as a new concept, a guest speaker gave the delegates a break, whilst further introducing and inspiring on the topic of changing limits. Altogether, the EGMUN Conferences are widely known for ambitious political debates, delegates from all over Europe and social activities that bring students together as both delegates and students. EGMUN is about making friendships across borders. 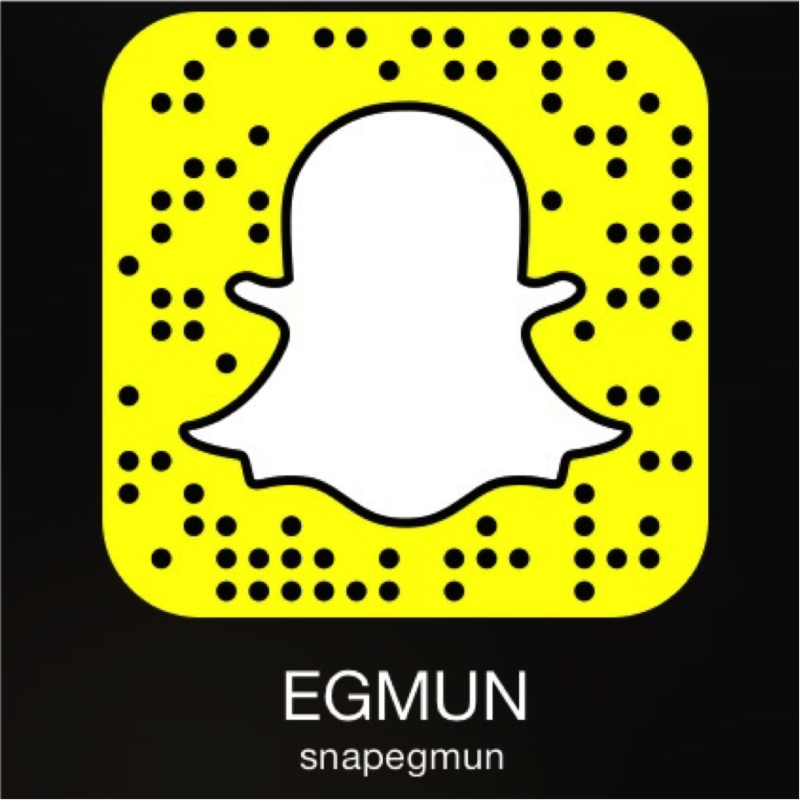 EGMUN is the largest MUN conference in Denmark; that pledges us, the Secretariat, to provide great fun, ambitious debates, and new friendships for all of our participants. We hope to see you at the next conference!